FARM TO FREEZER: Farm to Freezer is Back! UPCOMING EVENTS: Slow Living Summit, CCMA 2016 & More! Register for CCMA – The National Food Co-op Conference! Early bird regitration ends this Friday, April 22nd, for the 60th Annual Consumer Cooperatives Management Association Conference, June 9 – 11 at the University of Massachusetts, Amherst. This year’s conference is co-hosted by the member co-ops of the Neighboring Food Co-op Association, with Franklin Community Co-op and River Valley Co-op as primary local hosts. Register on/before this Friday, April 22 to lock in the early-bird rate for NCBA CLUSA members. The Early-Bird Full Registration Package includes conference materials and admission to all sessions, networking events and meals. Single-day and team registration packages are also available. Not an NCBA CLUSA member yet? Join today and benefit from the member discount on conference registration. Email NCBA CLUSA Director of Member Relations Thomas Bowen at tbowen@ncba.coop for details. The town of Amherst, our conference site for 2016, is nestled in the heart of “Co-op Valley” in Western Massachusetts. The region is home to our local host food co-ops, NFCA members Franklin Community Co-op and River Valley Co-op, as well as a diverse community of co-operatives and credit unions that reaches across sectors, many of which are working together to grow the co-operative economy. The University of Massachusetts, Amherst, is also home to a system of student-run co-operative businesses and the Department of Economics offers an undergraduate Certificate in Applied Research in Co-operative Enterprises, in collaboration with local co-op associations. The Campus Center is named for Murray Lincoln, UMASS alum, founder of Nationwide Insurance (a mutual enterprise), and member of the Co-operative Hall of Fame; and the campus library is named for W.E.B. DuBois, African American Scholar, co-founder of the NAACP and promoter of co-operative enterprise as a tool for economic empowerment. We look forward to seeing you in Western Massachusetts! Why attend the 2016 Annual Cooperatives Conference? NCBA CLUSA’s Annual Cooperatives Conference (ACC) is the only conference that brings ALL the co-operative sectors together in Washington, DC, to speak with a united voice to our elected officials and policymakers about the issues critical to U.S. co-operatives. You can play an integral role in educating policymakers in Washington: Plan now to join NCBA CLUSA May 2 – 4 as we hike Capitol Hill to communicate the impact of cooperatives in our communities! NCBA CLUSA is actively engaged in educating leaders in Congress and the Administration about the positive impact cooperatives businesses have on the U.S. economy. The recent launches of the Congressional Cooperative Business Caucus and USDA’s Interagency Working Group on Cooperative Development demonstrate the increasing traction the cooperative business model is gaining in Washington. In this election year, it’s more important than ever that cooperatives engage frequently with their local and national legislators to capitalize on this momentum and call for continued action to advance the movement! Our federal officials need to know who co-ops are, what co-ops look like, where co-ops are found within the economy, and why consumers consistently choose the goods and services co-ops provide. Educating our nation’s leaders about co-ops benefits each and every cooperative sector. We work hard to support our local producers and are excited to take part once again in the Farm to Freezer program. As part of the Neighboring Food Co-op Association (NFCA), a network of over 35 food co-ops and start-ups across New England, we’re increasing our impact as we grow the regional food system. 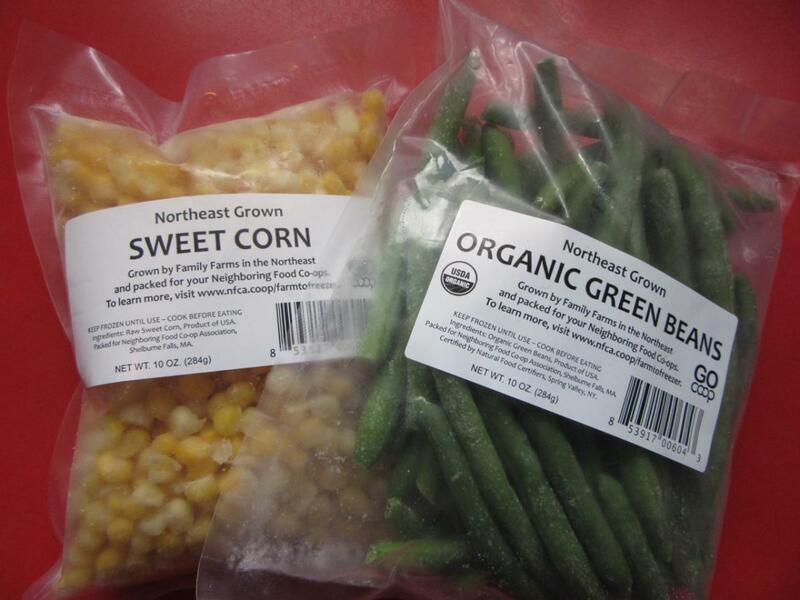 The NFCA’s Northeast Grown Frozen Fruits & Vegetables are easy to find in our freezer section – they’re packed with a simple black and white label in a clear package so you can see what’s inside. We hope that you will try these regionally grown and processed fruits and vegetables – available exclusively at your Neighboring Food Co-ops! – and let us know what you think. 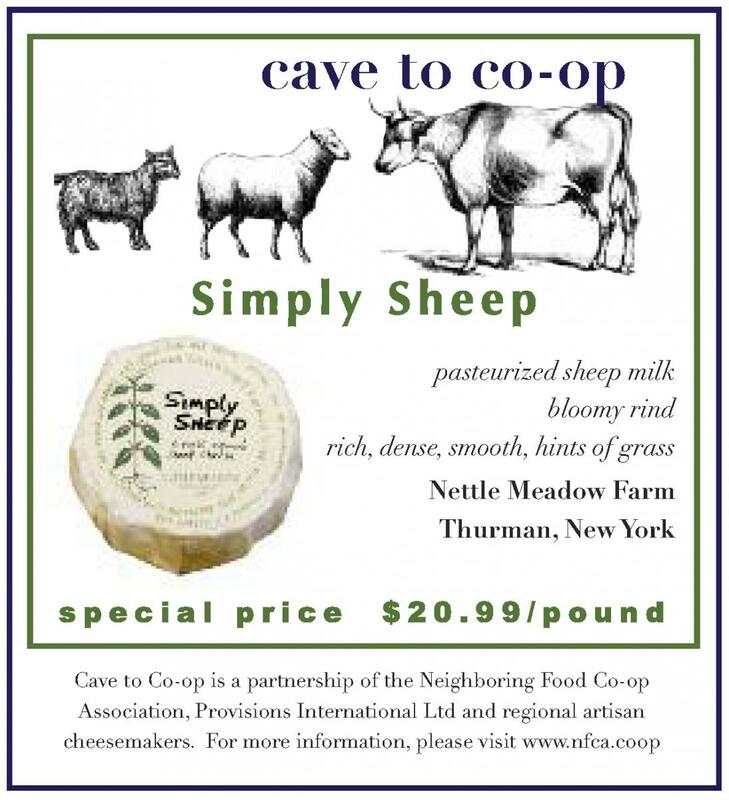 April’s “Cave to Co-op” special artisan cheese is “Simply Sheep” from Nettle Meadow Farm. Simply Sheep is a decadent, buttery, sheep milk bloomy rind cheese that is rich in flavor and extremely creamy. Perfect on its own with a slice of fresh fruit, Simply Sheep can also be used in the kitchen. A bill put forward by Sen. Pat Roberts (R-KS) that would have created voluntary labeling standards for GMOs and preempt states’ rights to require such labeling, failed in mid-March to get the votes it needed to move forward. Members of the Senate Agriculture Committee may rework the bill, referred to by opponents as the DARK (Deny Americans the Right to Know) Act II. A similar bill passed the House of Representatives last July. The Neighboring Food Co-op Association is an affiliate member of New England Farmers Union, which worked hard to convince New England legislators on the committee to reject the bill. New England Farmers Union supports mandatory, transparent labeling, as 90 percent of consumers say they want them. As part of its balanced, member-crafted policy, Farmers Union also supports farmers’ right to use biotechnology. Vermont’s GMO labeling law goes into effect July 1, and federal lawmakers are scrambling to get a national standard in place by then. The legislatures of the six New England states have all taken up GMO labeling bills, but the level of support varies across the bodies. A federal standard that would require mandatory labeling would go far to address consumer concerns about genetically engineered food. Use a symbol on the label, designed by the Agriculture Secretary, to disclosure the presence of GMOs. New England Farmers Union is working for GMO labeling. We need the support of food co-ops and consumers who care about this issue. The more members we have, the better traction we have with lawmakers and within our parent organization, the National Farmers Union. Please join New England Farmers Union today! Together we are United for Family Agriculture! The Neighboring Food Co-op Association (NFCA) is an affiliate member of the New England Farmers Union (NEFU), representing our commitment to collaboration among consumers and our region’s family farmers and fishermen to influence food system policy and build a more vibrant, resilient and co-operative food system in New England. NFCA Executive Director Erbin Crowell serves as Vice President of NEFU, and many of our Neighboring Food Co-ops are organizational members. For more info on our partnership & how you can become a member, visit: www.newenglandfarmersunion.org/co-operation. Register today for Slow Living Summit 2016 Food & Ag Entrepreneurship: How to succeed in business by slowing down taking place in Brattleboro, Vermont, April 28-30, 2016. The 2016 Summit taking place April 28-30 will provide forums for unique explorations of key topics in food and agriculture entrepreneurship, such as business planning, funding sources, refining and pitching ideas, ownership structures, social impact, collaboration, and food and agriculture business case studies. If you are a member of a Neighboring Food Co-op use this code when you register to get 20% off: SlowlySlowly2016. Hosted by the Neighboring Food Co-op Association in Amherst, MA, the 2016 CCMA Conference will challenge and inspire food sector leadership to address diversity and inclusion and make the case for a radical shift in thinking for food co-ops to differentiate themselves in an increasingly competitive natural foods marketplace. Celebrated on the first Saturday in July since 1923, this year’s theme is “Co-operatives: The Power to Act for a Sustainable Future,” a nod of support to the UN’s Sustainable Development Goals. On the 2016 Day let us speak out loud, on the value of co-operatives’ unique approach to sustainable economic, social and environmental development. Cultivating The Organic Grassroots Movement. The Northeast Organic Farming Association’s Summer Conference is the community learning hub of the NOFA universe. We learn, we play, and we enjoy a weekend of skill building, inspiration and entertainment. It is our opportunity to get together and inspire one another during a family friendly weekend with people living the same lifestyle, holding the same vision and working respectively in many ways toward the same goals.